I spent New Year’s Eve drawing caricatures for party-goers at Harrah’s Reno hotel and casino. I couldn’t help but sketch this little woman sitting for hours at a Poker game machine on New Year’s Day, still wearing her party hat from the night before. Wanting to avoid being caught driving through the mountains in a blizzard, I traveled by Amtrak. That required two buses and a train going, but only one bus and a train coming back. So, I did a bit of sketching in station waiting rooms. I walked to the Nevada Art Museum, which had several cool exhibits, and stopped for a few minutes on the way back to sketch this colorful parking structure near Harrah’s. Rhoda Draws 164 faces in 3 days! Oracle OpenWorld was an even better gig than the year before and the year before that. I had a few attendees who found me again after I drew them last year…one fellow who came back for his third year. 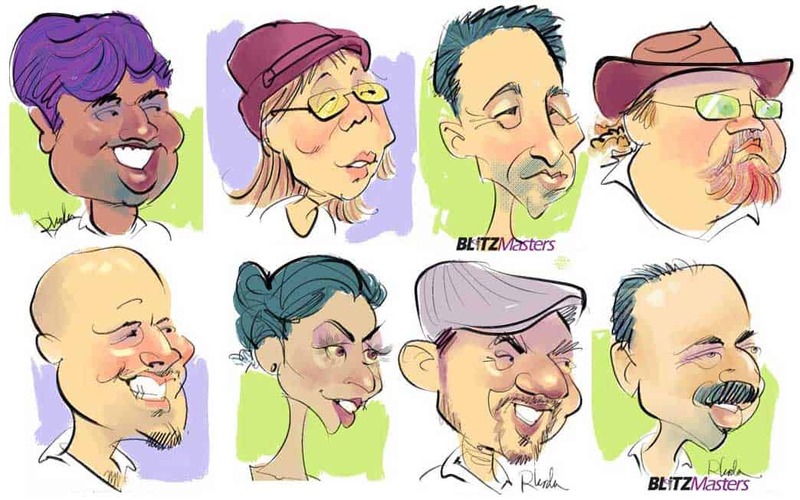 Here are just a few of the caricatures I created as “booth babe” for BlitzMasters, a small woman-owned company based in Seattle. I have a feeling I’ll be doing more events with these folks. Attention all who plan to attend the annual Oracle OpenWorld Expo at Moscone Center in San Francisco next week. I will be creating digital caricatures of attendees for a company called “Blitzmasters” at booth #3313. I’ll post some of my favorite drawings on these pages, after the show. I will present a slideshow of celebrity caricatures by a variety of world-class artists. Following that, I will demonstrate my own techniques, using both traditional and digital media. I will present the basic principles of creating a satirical portrait, by doing a live demo and showing examples in a wide range of styles. Participants will practice drawing caricatures from photos as well as live subjects. Just bring your sense of humor!